Have you ever been to a kid's birthday party without any party games? Well, this is because a children's birthday party cannot survive without party games. Games are the best part of any children's party and this is something that children look forward to the most, not to mention the cool prizes they will be getting if they win. Kids love the challenge of trying to win the game and competing with their friends. For them, this is so much fun and exciting and that is why you should never plan a kid's birthday party without any party games. The party games you will be choosing will depend on the place you are holding the celebration. You can do a lot more games if you have big space. You can have messy games if you the party is held outdoors. Plan at least 5-8 party games in a birthday party. And make sure that the games are not too complicated for the kids who will join in. Racing games and finding games are among the most favorite party games. Here are some suggestions on party games that you may want to have on your kid's birthday party. One is called Catch the Balloon game. This game can be played by 5-10 year olds and is pretty simple. The game starts by forming the children into a circle and giving them specific numbers. The child will the last number should be placed in the middle, he/she then calls out a number and throws a balloon in the air. The child with the number called should immediately catch the balloon before it hits the ground. If the child doesn't get to catch the balloon, he/she is out of the game. If the child catches the balloon, he/she will be the one in the middle and call a different number. Another very fun game for kids is called the newspaper game. You can ask them to form pairs and get a piece of newspaper. The goal here is to outlast the other teams. To start the game, the newspaper is still wide open and laid flat, when the music starts playing, the kids will all dance. Once the music stops, they should step inside the newspaper and make sure all the parts of their foot is inside the newspaper. The game progresses by folding the newspaper until it gets smaller and smaller. And the pair will win if they are the last one standing with the smallest folded newspaper on their feet. If you have rented quite a big place, you can have treasure hunting party games for the kids. You can draw a treasure map for them to follow and place clues in specific areas. They can work in pairs or in a team of 3. Include hidden codes in the map that they can decipher for themselves. Kids will love the mystery and finding the lost treasure. Afterwards, make sure you have a good prize for their efforts. Just be cautious where you place the clues and ensure that all areas are safe. Available on iPhone: bit.ly Available on the Nokia N900: store.ovi.com The survival of the Angry Birds is at stake. Dish out revenge on the green pigs who stole the Birds eggs. Use the unique destructive powers of the Angry Birds to lay waste to the pigs fortified castles. Angry Birds features hours of gameplay, challenging physics-based castle demolition, and lots of replay value. Each of the 63 levels requires logic, skill, and brute force to crush the enemy. Protect wildlife, or play Angry Birds! This is an awesome game that I saw at a party the other day. 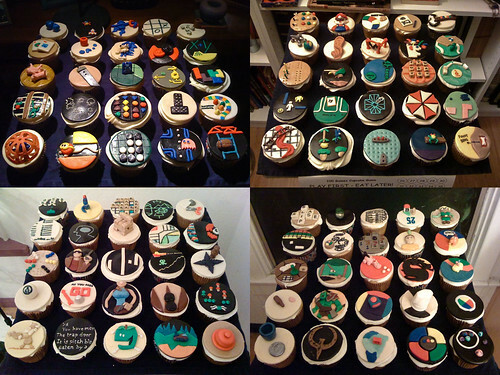 They people hosting made 100 cupcakes, each one representing a certain game, board, video, or otherwise. This was an amazing effort, considering the detailed work and imagination that went into it. The goal of the game was to identify all the games from the clues on top of the cupcakes. I challenge you to do the same and leave a note around the cupcake with the name of the game. If the cupcake already has a note, don't make another one, even if you think the person identified the game incorrectly. I'll review the notes periodically and remove the wrong ones. Click on All Sizes button to see the larger version of the image. If you prefer to play on your own, download the image, upload it to your own account, put the notes around the cupcakes yourself, and leave a comment here referring to it. The highest score at the party was 89.